Even though there were many questions and contradictions whether to embrace telehealth or not, nowadays it is a well-defined pilot that flies with its own speed and direction. For the past few years, healthcare experts and practices have raved about its undeniable benefits, while still having doubts over security and practicality. However, technology and acceptance have finally made telehealth a reality for everyone in the healthcare industry. According to many researchers and government officials, a steady stream of innovation is already being widely adopted and now it is time to extol the virtues of telemedicine. As an example, Latoya Thomas, the Director of State Health Policy at the American Telemedicine Association (ATA), sees telehealth as a delivery model that may not be familiar to everyone, but where it is available, it should be used. – Video conferencing (real time) – two-way interaction between a person and a provider using audiovisual telecommunications technology. In this case, live video can be used for consultation, diagnostics, and patient treatment. Real time telehealth solutions, such as transfer of still images, have been used in telepathology for many years as well as real time transfer of video images has been widely explored in telepsychiatry. – Store-and-forward involves the transmission of a recorded health history (pre-recorded videos, digital images) through a secure electronic communications system to a specialist. Unlike a real-time technology, it provides access to data after it was collected, and involves communication tools such as secure email. – Remote patient monitoring encompasses personal health and medical data collection from an individual in one location via electronic communication technologies, which is transmitted to a provider in a different location. As an example, recently healthcare IT giant Cerner and Truman Medical Centers have partnered up to create disease management programs that employ patient monitoring technology in patients’ homes. The clinical application of patient monitoring devices is expanding at a fast pace as well. The latest news digest reveals some great examples to keep track of patients, such as a bracelet to predict asthma attacks through breath, a bra to detect the early signs of breast cancer, a wristwatch for those suffering with Parkinson’s disease, and a hair clip for deaf people to convey sounds through the hair. – Mobile health (mHealth) seems to be one of the fastest growing tendencies driving improvements in healthcare. Around 7 million patients have already been using various forms of mobile applications, and it is estimated to reach 50 million by 2020, according to a new BCC Research report. Supported by mobile communication devices, mobile health is proved to improve patient compliance with treatment recommendations, reminding patients to take medications, educating about health issues, and better engaging in care. For clinicians it assists in solving some of healthcare’s biggest problems, such as chronic disease management and clinical decision making. – Inside Care represents 100% of collected health record data. In other words, it may be called the “medical home”, “universal patient record”, supporting patient self-efficacy. – Telehealth-enabled. As a care giver has already long-term existing relationship with a patient, telehealth technology is used here to capture all data. As an example, video-consultation enables more efficient and scalable care integration. – Extended Telehealth. In this case, there is a risk of care fracturing, because of the sheer number of additional clinicians. For instance, remote monitoring by a nurse will include an additional care provider, but it will be still tightly connected to the care team. 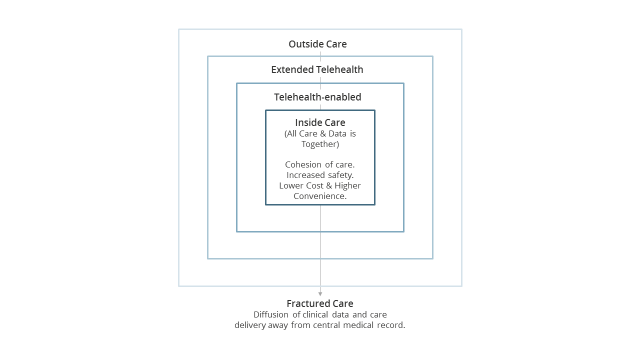 – Outside Care – telehealth functions completely separately from the existing care team and only includes encounters, e-visits, patient apps and devices. Recognizing the telehealth potential for the industry, there are multiple providers on the market, offering their own telehealth solutions to the problems above. 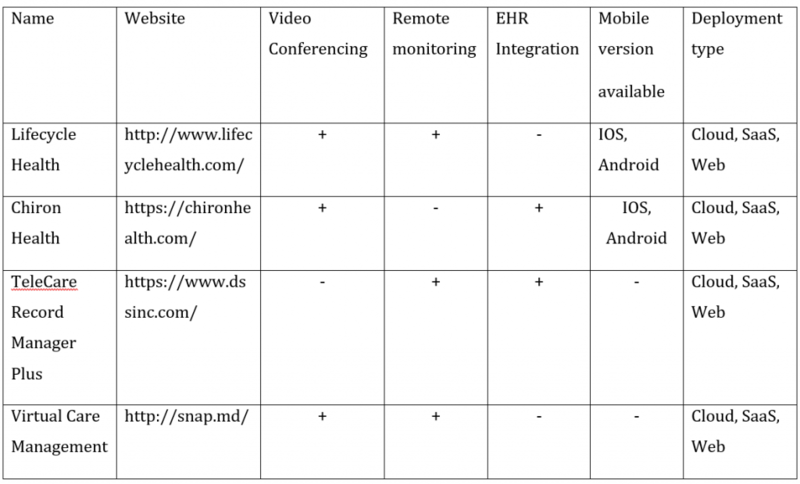 The following table illustrates some examples of telehealth solutions for each telehealth domain respectively. Although these solutions do offer a type of “out of the box” functionality, the complicated nature of healthcare industry sometimes imposes requirements that they are unable to meet, that leads to situations where the stock solution is just not enough. In these cases, there are custom software development companies capable of designing tailored-made teleconferencing solutions matching all requirements and evolving as the environment changes. Telehealth is not an innovation anymore, now it is seen as a powerful topic for the coming years having a profound effect on every area of healthcare. As a means to increase convenience and scale quality, telehealth may raise the bar for the industry, leaving ones who cannot adopt it on time behind in a race for patients. Roman Chernyshev joined DataArt in 2004 as a software developer/team leader, and has overseen some of DataArt’s key projects in the financial, healthcare and telecom sectors. He leads application development on Microsoft .Net platform, focusing on systems architecture and agile software development methodologies. Prior to DataArt, he ran his own ISV company and worked at several leading Russian IT firms, developing new ERP systems and logistics & accounting applications for brand name clients. Roman has a MS degree in Robotics St. Petersburg State University (Russia). Roman is a regular media commentator on health and life sciences technology and has been quoted in TechWeekEurope, Raconteur, The Times, Internet of Business, IDG Connect, Information Week and numerous other news outlets.